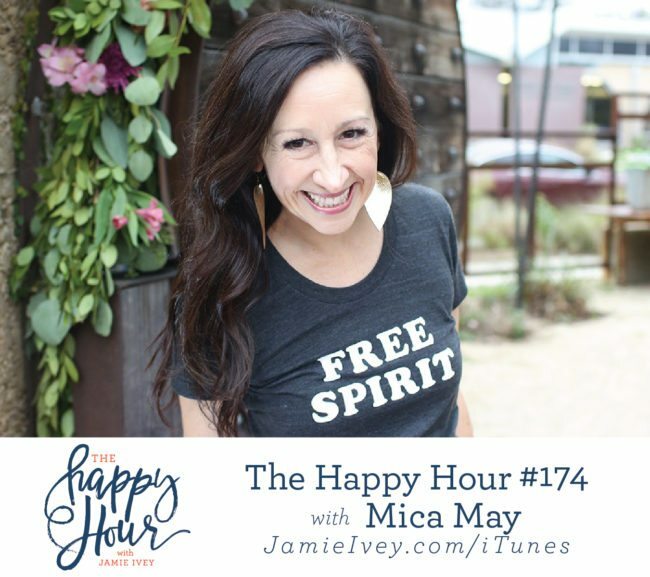 My guest for The Happy Hour #174 is Mica May. Mica is the Founder and CEO of lifestyle brand, May Designs. She believes every day life should be lovely, and is on a mission to make all of life’s normal activities just a little bit more magical - from paper goods to her new apparel line. Her notebooks just launched in Target stores nationwide, were named one of Oprah’s favorite things and have been featured on The Today Show and Good Morning America. Mica lives in Austin with her best friend and husband, Jonathan and their three kids. On today's show she tells us exactly how her love for pretty paper transformed into the company that we know and love today! Mica shares candidly about the moment she had to make the decision to keep moving through the hardships of starting a business, or deciding to throw in the towel and quit. On behalf of all of us that love our May Designs books, we're glad she continued moving forward with her business. The final part of our show was powerful as Mica and I discussed the moments when she was told that her son had Down's Syndrome. Her thoughts on borrowing grief and guilt were moving to me, and I'll never forget our conversation. I know that you'll love the show!